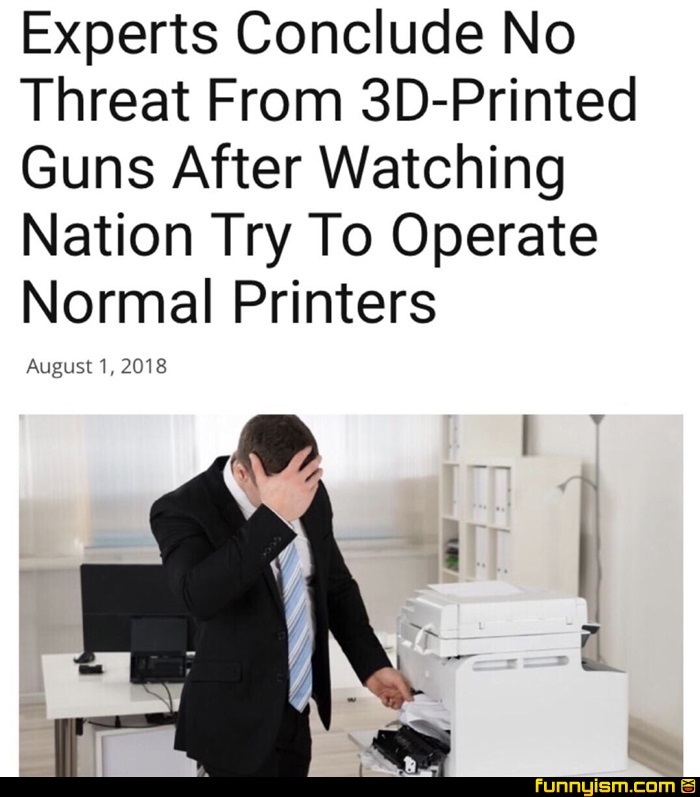 I think printers cause more violence than guns. @Elmato, really? I run a 3D printing company but have never thought about it. Is it because of how precise the parts have to be? @Tyrellious, yup, I saw a video from Louis Rossmann, where during a repair, a commenter asked the question. He said something like "you cant use any old $90 3D printer, it's going to need a 6 figure machine "
@Light Skinned Brotha, theres nothing stopping someone from currently creating a firearm with a garage and second hand CNC equipment. 3d printed guns is a boogeyman, unless of course antifreedom folk keep talking about it. @Light Skinned Brotha, lets ban hobbyist or start up manufacturing! @Elmato, so would it need like .0001 mm precision? I was looking into printing, serializing, and inserting compliance plates into lowers to sell, but couldn’t really find any info. This actually isn't too far off though. There are a ton of reasons why 3D printing guns doesn't really work. 3Dprint.com has a great article about it. Can someone PLEASE show the morons scared of 3d printed and ghost guns what an M80 inside a plastic tube does. Ghost guns arent a thing either. Even if they were, there are plenty of states that dont require a person to register a shotgun or traditional hunting rifle so what does it matter if California doesnt know about an unregistered firearm? Even better, the only reason it is an argument is because the government didnt get their take on the sale, manufacture or license to create an 80%lower. It is messing with taxes and we cant do that, no can we? It’s nit often that I laugh out loud at memes! Guns dont cause the violence guns end it completely.